Rainfall anomalies also have monthly spatial distributions analogous to those for temperature. North Atlantic storms in January 2014 brought flooding to Western England. That month’s distribution shows that abnormally high rainfall also affected the western coastlines of France, Spain and Portugal, the Alps and Eastern Europe. Rainfall “daily” anomalies in mm for Jan 2014. 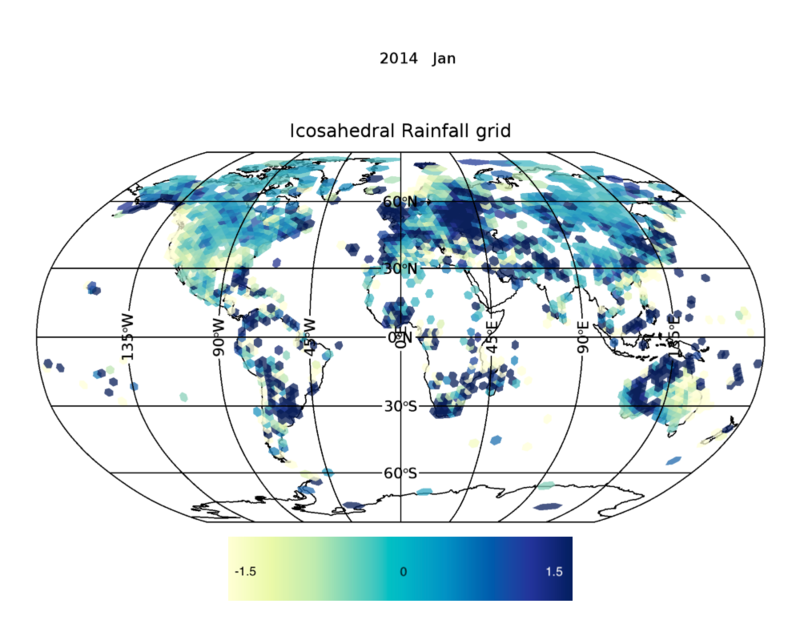 The Western coastline of Europe, the Alps and Russia all had exceptional rainfall. Here is an animation of average rainfall anomalies from Jan 2014 to March 2018. The distribution of abnormal “wet areas” is not random but instead flows with the seasons. Colour Scale in mm/day for each month. Only the darker blue spots are significantly wetter than the 30 year average (1961-1990). Light blue to yellow areas are all dryer than normal. Finally we look at the old data from 1838 to 1860 which gives a strong positive ‘global’ rainfall anomaly in the annual data. The values are in reality very regional, as are those for temperature anomalies. Animation of the early precipitation data showing that it was dominated by Europe with just a few stations in the US and Australia. The early stations are sparsely distributed mainly in central Europe, US & Australia. They indeed show mainly positive rainfall anomalies. It would seem that these areas were actually wetter than today, but just how reliable these trends are is unclear. Perhaps the rain gauges or procedures were less accurate than they are today. This entry was posted in AGW, climate science and tagged Rainfall. Bookmark the permalink. > Perhaps the rain gauges or procedures were less accurate than they are today.